The Wakhan Corridor in Afghanistan is quite remote. A look at maps or Google Earth will indicate the lack of even place names except in the main river valleys. The Secret Compass uses this fact to advantage for expeditions in the region. Here we examine three glaciers north of Sarhad two draining into the Tchap Dara Valley. Haritashiya et al (2009) examined fluctuations of 30 Wakhan Cooridor glaciers from 1976-2003. They found that 28 of the glaciers had retreated. Here we examine Landsat images from 1998, 2002 and 2013 with the green arrows pointing the 2013 terminus position of the northern glacier, the red arrows to the 1998 terminus position of the center glacier and the yellow arrows indicating the 1998 terminus location of the western glacier. The blue arrows indicate ice flow. 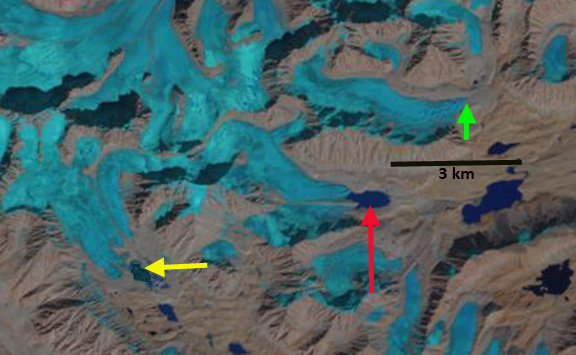 In 1998 the red arrow indicates the terminus of the center glacier, which also has an ice cored medial moraine that extends nearly across the entire proglacial lake that the glacier terminates in. The northern glacier extends beyond the green arrow. 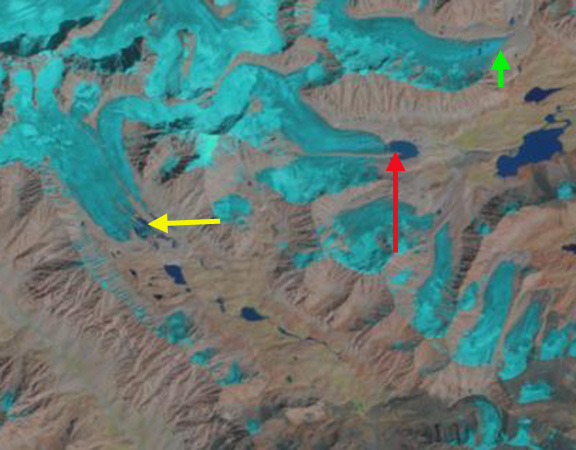 The western glacier extends to the yellow arrow filling much of a small basin. In 2002 there is little evident change at the northern glacier. The center glacier has retreated leading to lake expansion, and the medial moraine extending into the lake is also shorter. 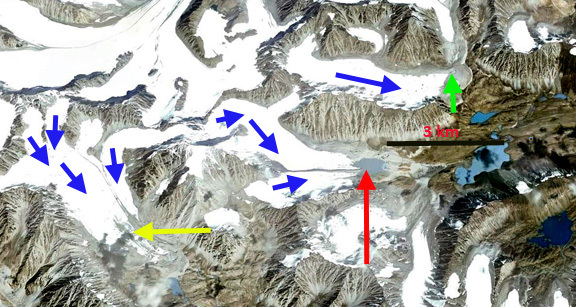 The western glacier no longer reaches the yellow arrow. By 2013 the northern glacier has retreated 200 meters to the green arrow. 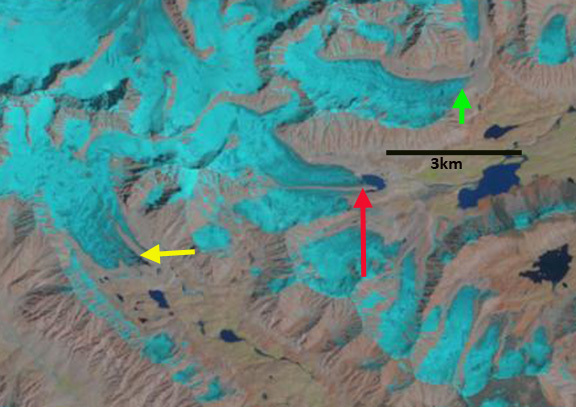 The center glacier has retreated 400 m leading to the same amount of lake expansion, the medial moraine no longer extends into the main lake basin. The western glacier no longer reaches a lake that has developed in the basin at the 1998 terminus position. The retreat is 300-400 meters. The retreat over 15 years is substantial for small glacier like this. This parallels the retreat at nearby Zemestan Glacier and the Emend River headwaters glaciers. This entry was posted in Glacier Observations and tagged afghanistan climate change, afghanistan glacier melt, afghanistan glacier retreat, tchap dara valley glacier retreat, wakhan glacier retreat. Bookmark the permalink.